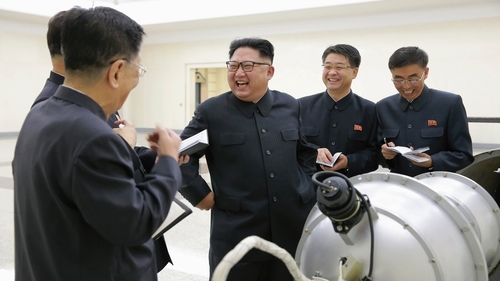 North Korea has rejected a "illegal and unlawful" UN Security Council resolution imposing tougher sanctions following the reclusive nation's sixth and largest nuclear test. North Korea ambassador Han Tae Song also told a UN-sponsored Conference on Disarmament in Geneva that the United States, which drafted the resolution, would soon face the "greatest pain" it has ever experienced. Mr Han said: "The Washington regime fired up for political, economic, and military confrontation, (is) obsessed with the wild game of reversing the DPRK's development of nuclear force which has already reached the completion phase". The Democratic People's Republic of Korea is "ready to use a form of ultimate means", Mr Han said. "The forthcoming measures by DPRK will make the US suffer the greatest pain it ever experienced in its history," he added. China and Russia backed the move to impose a ban on textile exports and restrict shipments of oil products to North Korea. The US watered down an initial tougher draft resolution to win the support of China and Russia. It was the ninth sanctions resolution unanimously adopted by the 15-member council since 2006 over North Korea's ballistic missile and nuclear programmes. "We don't take pleasure in further strengthening sanctions today. We are not looking for war," US Ambassador to the United Nations Nikki Haley told the council after the vote. "The North Korean regime has not yet passed the point of no return." "If it agrees to stop its nuclear programme, it can reclaim its future ... if North Korea continues its dangerous path, we will continue with further pressure," said Ms Haley, who credited a "strong relationship" between US President Donald Trump and Chinese President Xi Jinping for the successful resolution negotiations. A week ago Ms Haley called for the "strongest possible" sanctions, but after several days of negotiations, Washington dropped several measures to win the support of Russia and China, including a bid for an oil embargo and the blacklisting of North Korean leader Kim Jong-un and the national airline. Russia had condemned the idea of tightening sanctions on North Korea without any political push to resolve the crisis. Russia's UN ambassador, Vassily Nebenzia, told the Security Council yesterday that Russia supported the resolution because "leaving nuclear tests without a firm reaction would be wrong". He again raised the Chinese and Russian proposal of a dual suspension of North Korea's nuclear and ballistic missile testing along with US and South Korean military exercises in a bid to kick-start talks. Ms Haley has dismissed it as insulting. "We think it's a big mistake to underestimate this Russia, China initiative," Mr Nebenzia said. "It remains on the table at the Security Council and we will insist on it being considered." There was new political language in the resolution urging "further work to reduce tensions so as to advance the prospects for a comprehensive settlement". China's UN ambassador, Liu Jieyi, called for a resumption of negotiations "sooner rather than later." He called on North Korea to "take seriously" the will of the international community to halt its nuclear and ballistic missile development. Japanese Prime Minister Shinzo Abe said after the council vote that it was important to change North Korea's policy by imposing a higher level of pressure on the country than ever before. North Korea is now banned from exporting textiles – its second-biggest export after coal and other minerals in 2016, totalling $752 million, according to data from the Korea Trade-Investment Promotion Agency. Nearly 80% went to China. The resolution imposes a ban on condensates and natural gas liquids, a cap of two million barrels a year on refined petroleum products, and a cap on crude oil exports to North Korea at current levels. China supplies most of North Korea's crude.